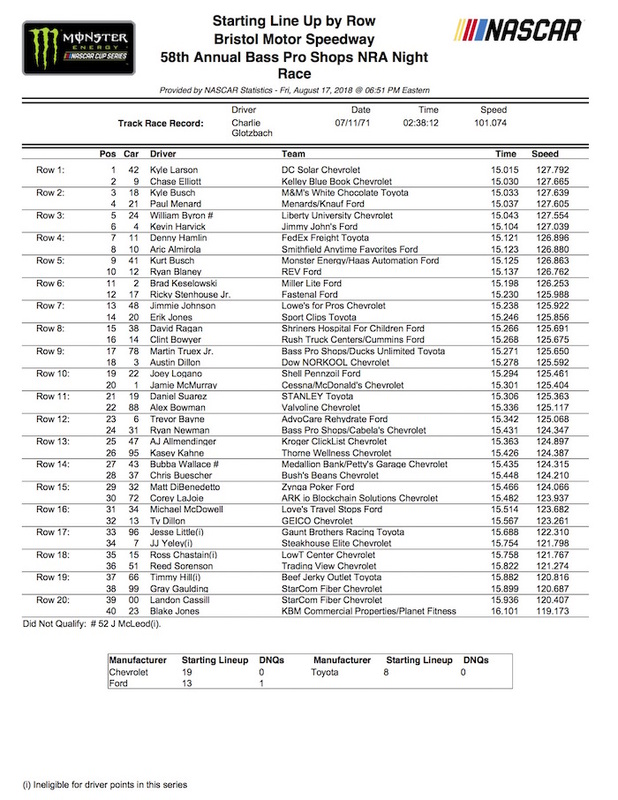 Kyle Larson got around Bristol (Tenn.) Motor Speedway in 15.015 seconds (127.792 mph) Friday in the third of three rounds of Monster Energy NASCAR Cup Series qualifying to claim the pole for Saturday night’s Bass Pro Shops NRA Night Race. 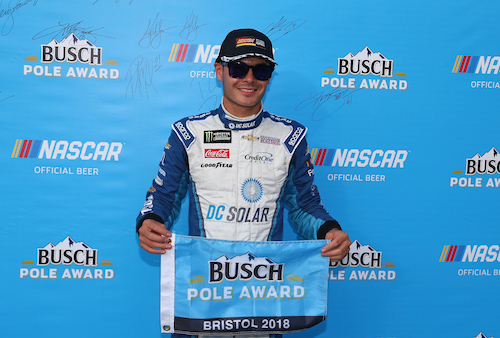 Larson’s latest pole is his third of the 2018 season, but the first of his Cup Series career at Bristol. Chevrolet swept the front row in qualifying, with Chase Elliott taking second to start alongside Larson. Larson was tops in all three rounds of qualifying. His 14.997-second/127.946 lap in the opening round was the fastest lap, overall, of the three-round session and was the only sub-15-second lap turned in during qualifying. His lap of record in the second round clocked in at 15.034 seconds/127.631 mph. Elliott also was second to Larson in round one. Three Chevrolets qualified in the top-five, with Elliott’s Hendrick Motorsports teammate William Byron in fifth. All three manufacturers were represented in the top-five, though, with Toyota driver Kyle Busch in third and Ford driver Paul Menard in fourth. Menard was second to Larson in the second round of qualifying. While Chevrolet took the front row and most of the spots inside the top-five, Ford had the most representative in the final round of qualifying, advancing seven cars to the round of 12 — Menard in 4th, Kevin Harvick sixth, Aric Almirola eighth, Kurt Busch ninth, Ryan Blaney 10th, Brad Keselowski 11th and Ricky Stenhouse Jr. in 12th.